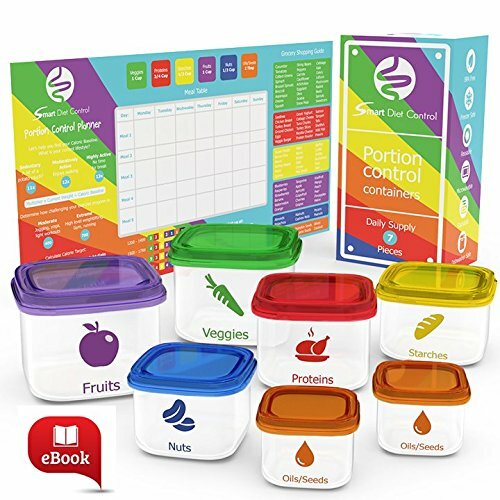 Home › Best-Sellers › Sdc - 7 Piece Portion Control Containers Kit Comparable To 21 Day Fix With Co..
Sdc - 7 Piece Portion Control Containers Kit Comparable To 21 Day Fix With Co.. BONUS RECIPE eBOOK, A MOTIVATING 21 DAY MEAL PLANNER CHART & USER GUIDE - The Smart Diet 21 Day Meal Planner Chart contains a calorie calculator, meal table, measurement tracker, grocery shopping guide and mouth watering recipes to help you organize what to have on your menu for the day! The free user guide leaflet comes with the box to give clear instructions to help you use your 7 piece portion control containers to the best effect. DIET SELECTION COULDN'T GET ANY EASIER - The portion control containers are color coded: Green = Veggies 1 cup, Red = Proteins 3/4, Yellow = Starches 1/2 cup, Purple = Fruits 1 cup, Blue = Nuts 1/4 cup, Orange = Oils and seeds 2 oz. This color coded containers program will be used to help you achieve your weight loss goals by taking control of your daily intake. Comparable to 21 Day Fix. KEEP DISCIPLINED WITH SMART PORTION CONTROL - There is no going over your limit! What you put is what you'll eat! These containers are precisely measured for serving proper portions so you don't have to worry about counting calories or weighing your food. HIGH QUALITY BUILT TO LAST A LIFE TIME - Tight lids and strong containers to let you carry them anywhere without any spillage! Top-rack dishwasher safe, stackable, 100% Food Safe, freezer safe, reusable and microwavable. BPA-free Plastic and DEHP-free. 100% SATISFACTION GUARANTEED OR YOUR MONEY BACK - We stand behind our products at Smart Diet Control. You must be 100% satisfied with any item that you ever order from us. If not just simply return your purchase back to us. We are not satisfied until you are! Color:Multi-color lids This special offer is available for a limited timeonly. PLEASE DON'T MISS OUT! Order now and when you do consider ordering onefor your very best friend, this makes a great gift!